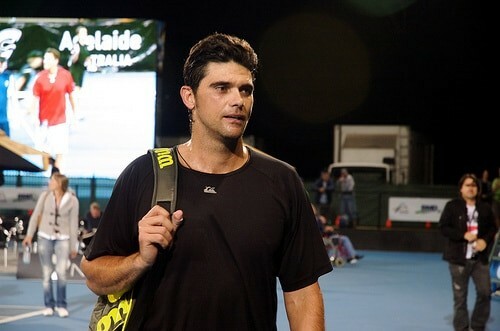 Former world #8 (April 1999), Mark Philippoussis has announced that he will be making a comeback to tennis at the 2011 Wimbledon Tennis Championships. Philippoussis, who turned to professional tennis at the age of 18, made waves in the sport of tennis. Philippoussis never won a major tennis title, however; he was a finalist two times (Wimbledon 2003 and US Open 1994). He also has 11 career singles titles and 3 career doubles titles under his belt. Philippoussis first retired from tennis back in 2002, where several knee injuries forced him out of tennis. During the Davis Cup Final of 2003, Philippoussis beat Spain’s Juan Carlos Ferrero, however; he did suffer a pectoral tear at the of the second set of the tennis match. Later that same year, Philippoussis had gone through 3 knee surgeries and entered Wimbledon, where he made it to the finals. Philippoussis lost to Roger Federer. If you have ever watched reality television, you know that Philippoussis appeared in the MTV reality show Age Of Love, where Philippoussis starred as the eligible bachelor on the reality dating show. Enough about what he’s done, let’s look at what’s going to happen at Wimbledon in 2011. Most certainly Philippoussis will be challenged at the tournament, he is kind of old (in tennis years) and the game has changed slightly since his last professional tennis appearance. We’re not entirely clear on the exact details of his comeback (wildcard, qualifier, etc.) however; we just wanted to bring this to your attention and we will keep you posted as quickly as the details come out. Currently Mark Philippoussis is playing with the Head YouTek Prestige Mid tennis racket.